For Duhnke Millwork, the move was worth it. The millwork producer moved to a new 115,000-square-foot building in Lenexa, Kan., in June 2004 after 14 months of planning. "We looked at different-shaped footprints because we didn't want to limit ourselves in an expansion," says president John Duhnke. "The move was the best operation I've ever been involved in," says Stephen A. Ingalls, director of project management/quality control. "The move started at noon Thursday, and we were in fabrication the following Monday morning." Ingalls doesn't recall a significant challenge for the company's 62 employees during the move, although it took some time to get rid of the clutter. Duhnke's old location was a 1950s' vintage building with 45,000 square feet in the Fairfax section of Kansas City, Kan.
"The move went off without a hitch, almost to the minute," he says. One reason was preplanning. Each tool and pallet in the old location was assigned a specific zone in the new plant, A-1 or C-4, for example. Everything in the old plant had a specific destination in the new building. 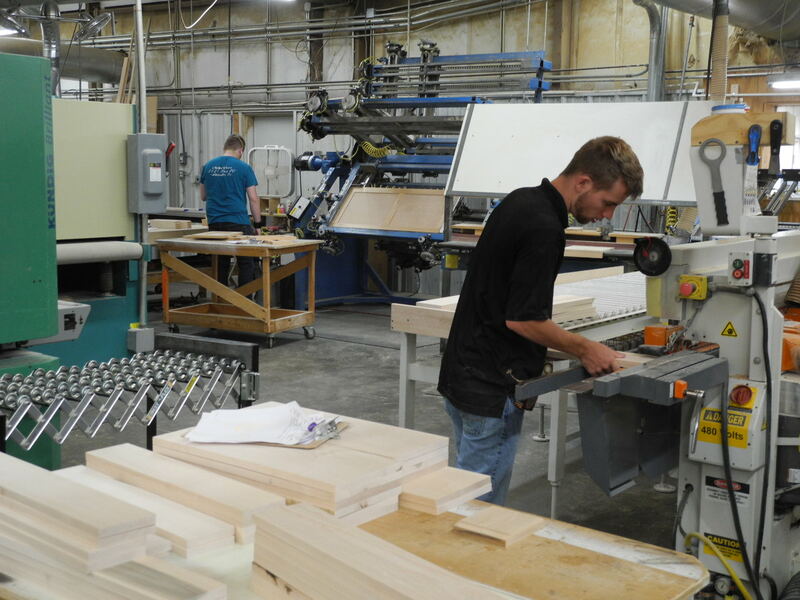 Duhnke is a major producer of millwork in this area of the Midwest, with customers in Missouri, Kansas, Nebraska, Indiana, Colorado and some national accounts. The company did a lot of interior work at the Kansas City (Mo.) International Airport renovation, including paneling, solid surfaces and public areas in all three terminals. The company also works with law firms and health care facilities. A revival of the downtown in Kansas City, Mo., brings quite a bit of interior work. "We have consistent quality, and we are a process-driven company that is continually trying to improve the processes that we have employed," Duhnke says. "Whether it is quality in the product going out the door or quality engineering to achieve that, we are always looking for the best people in the industry to help us." To help determine the best layout in the new location, Duhnke consulted with its major equipment supplier. "There was a production flow that we wanted to achieve," Duhnke says. "We worked with Stiles Machinery to help us lay that out with their products." "To a great extent, engineering drives the processes of our company," Ingalls says. "We want to ensure that the work orders that go to the plant for fabrication are as perfect as they possibly can be." 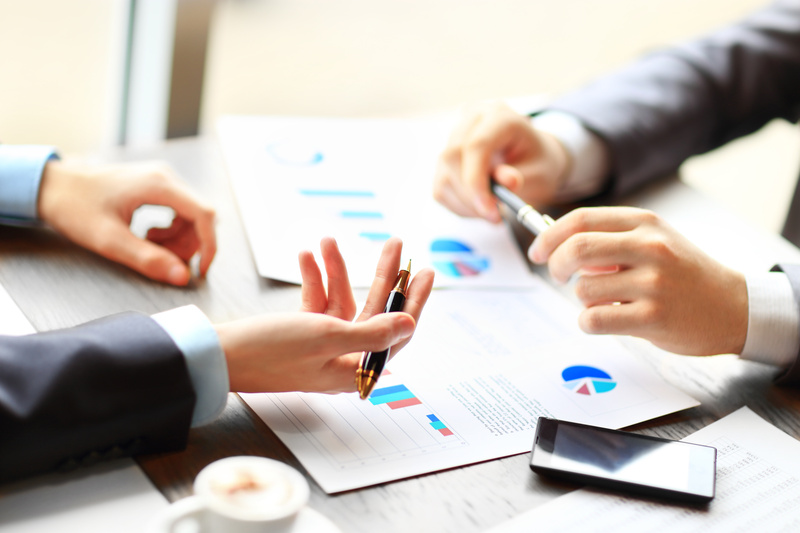 After selling the job, sales and estimating do a handoff with the project management team. "We've begun to have engineering sit in on that handoff," Ingalls says. The project manager then meets with the customer to determine time lines, things that aren't easily communicated on a piece of paper. Next, project management and engineering go through job setup, which is a time line review. Ingalls says they try to put the job back into the customer's hands so they can get the submittals to the customer for approval in as short a time as possible. Work orders go to the plant manager. "We've conceived up front about how we think the job should flow through the plant," Ingalls says. "Engineering drives how we make things." A work order packet is intended for each department that touches the product. This goes through the plant manager. The new Lenexa plant is divided into six areas. The panel processing section cuts parts and feeds them to a box line, custom area, store fixture area and tops department for assembly. Finishing is the final area. Panel processing is the heavy hitter in the plant. Panels are cut on Holzma HPL 380 and HPP 81 saws first, then go to either the Brandt KD 79 or Homag 9800 edgebander, and then to one of the two Weeke point-to-point machining centers, an BP150 and a BHC 350. A "fast-track" line bypasses the machining line. 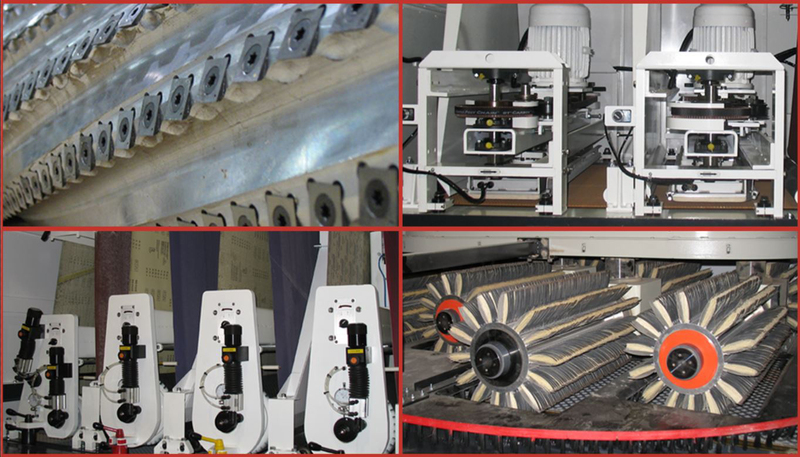 Panels can go directly from the saws or edgebanders, sidestep the roller conveyor system that goes to the machining center, right to the "bullpen," a staging area where the jobs are pulled together. These are all linked by roller conveyors. Parts are sorted by cabinet boxes at that point. Cabinets go to two Ligmatech case clamps, then to hardware and door installation. Also here is a Heesemann MFA-6 sander. 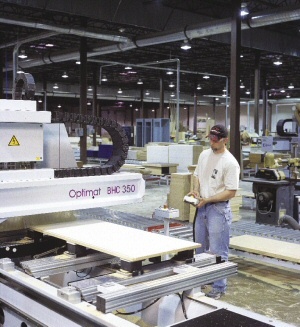 The tops department handles cutting and fabrication for plastic laminate and solid surface materials. "We try to maximize the amount of pre-cut parts that go through the panel processing line, and deliver pre-manufactured parts to the custom, fixture and tops departments, and they assemble those parts as much as possible," Duhnke says. "The custom craftsmen could take a drawing, with no assistance from the panel processing department, and do a cut bill, building those custom transaction desks and furniture pieces by hand," Duhnke says. The company believes the panel processing department should do as much cutting as possible before pieces go to other departments. It tries to optimize the use of those tools, instead of having a craftsman running the Altendorf, Powermatic or SCMI sliding table saws. The custom department also makes use of a small Brandt edgebander, and Powermatic shapers and edge sanders. Duhnke can offer a full range of finishing, from painted products to the highest-end transparent finish. The company installed four new Col-Met finishing booths with Kremlin spray guns in the new location. "We have done many large jobs that required a factory finish, but we had limited capacity in the old building," Duhnke says. "Now, obviously, we have a lot more capacity." Duhnke describes finishing as a linked system, with centralized pumping stations and pumps to each one of the finish areas. "We're dedicated to pre-catalyzed finishes," he says. Each booth has dedicated pre-cat and post-cat spray guns. Duhnke says he sees further growth in the company.